Every time I go to a tournament, I think about getting a new dog. It happened to me again this past weekend. I already have 9 dogs, so this is bad. But I play a lot of NAFA flyball, and we need a young, fast height dog. We actually have tons of height dogs in our club (so many, in fact, that my teammate Kristie farms hers out to other teams and says she runs a "height dog brothel"), but none of our dogs can run under 5 seconds consistently. This past weekend I watched my 10-year-old Jack Russell, Cho, run her little heart out on our "A" team (which is actually our Multi team, not Regular) and even though she was running lots of 5.1's, she wasn't pulling out the 4.5's and 4.6's she used to run in her heydey. Even Chos get old. I have a female Border Staffy in training, but she's going to jump 11" and dang, that's high. I know Spring Loaded broke the world record over 11", but we're no Spring Loaded. I think we need a smaller dog. So I'm sitting here debating what to do about it. Talk one of my teammates into getting a puppy. Just be happy with the way things are now. 1. Talk one of my teammates into getting a puppy. Everybody in my club is pretty much dogged-out. No room for more dogs. (I've been telling myself the same thing on and off for a couple of years now, too. My youngest dog is almost 2 years old and my oldest is 12.) So I don't think I'm going to have much luck trying to talk one of them into getting a height dog. Besides, finding a great puppy for somebody else in your club doesn't always work out the way you want it to -- they have their own ideas for the dog, their own training style and conditioning philosophy. 2. Just be happy with the way things are now. This is what I've been doing for the past couple of years, and it has worked pretty well for me. I'm really happy being with my club and I have no plans to go elsewhere. It's hard to find a group of people you genuinely like, respect, and enjoy hanging out with for an entire weekend, and I've found them. Plus, I've been distracted for the past few years, so flyball has dropped down on the priority list. Divorce, two kids (ages 6 and 9), full-time job, new boyfriend, new hobbies. So I've been content to go to the occasional practice, travel every once in a while to a tournament, and just have fun playing flyball, whether we're running in NAFA or U-FLI, Open or Veterans or Division 3 or whatever. "Doesn't matter to me, just tell me which dogs to bring, which team they're on, and which position you want me to run in, and I'm there." I'm definitely not the same crazy competitive flyball person I was a few years ago, as some of my old teammates can attest. But you know, competition runs in my blood...I come by it honestly. My mom is a high school volleyball coach and her team has won the state championship for the past 5 or 6 years. When we were vacationing in Maine a few years ago, playing a nice relaxing game of badminton in the back yard, she was busy trying to kick all our asses (picture the water volleyball scene in "Meet the Parents"). I want to run fast. I want to win. I can't help it! And our Multi team would run in the low 17's, maybe even 16's, with a low-4's height dog. Assuming I can talk him into it, I need to figure out what I want and who to get it from. Since I want a NAFA height dog, my options are sort of limited. No DoubleBorder-BorderJack-BorderStaffy-Whippet-Pterodactyl mix for me. (It's kind of astounding what's out there these days, and what people are willing to pay for them...I could probably write another blog post or two just on that topic). Anyway, for a NAFA height dog I'm thinking Border Jack, purebred Staffy, or some other sort of small mix. I used to be a Jack Russell person through and through -- before I ever knew flyball existed, I had three Jack Russells and was going to terrier trials all the time (I STILL have three Jack Russells!). But you see less and less JRTs in Division 1 these days -- they're just not as fast as a lot of the mixes, and with the 1" jump height reduction in NAFA, slightly bigger dogs can play the role of height dog now. I could make my own Border Jacks, I guess. I have all the necessary ingredients. But it'll be hard enough talking my boyfriend into ONE puppy, much less a whole slew of them. I haven't bred a litter in over 12 years (we had eight JRTs in one litter), but I still remember like it was yesterday the poop smeared all over the kitchen floor and the little bits of chewed-up paper everywhere. This idea still has appeal, though. Are any of you going through the same type of internal debate, or have you gone through it recently? I would love to hear your thoughts. I think there is a future post couched in here about how we are always looking for "The Next Great Thing." 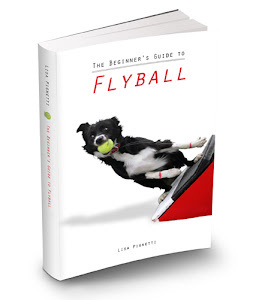 We flyball folks are always in search of "The One" -- the amazing 3.5-3.6-3.7 dog that practically trains itself and astounds everyone in the region with its amazing speed, disposition, and looks (and of course, its cool flyball-worthy name). But like I said, future post. Gotta let that one stew around in my brain a little bit more. You forgot Option 4 - borrow a height dog from someone else. You're right, Laura! I did forget the borrowing option. If anybody has a nice low 4's (or hey, while we're wishing, let's say sub-4) NAFA height dog I can borrow for a couple of years, let me know! Lisa - work on getting Fringe up and running. 11" may be high but it is something until either someone has room for a new height dog potential or you decide that you want to get back into flyball full force. Just hold off and wait and see what happens. Ok, for me, there is nothing I would like more than to have a new puppy. A new dog to train, new hopes, something to once again motivate me. But here's the thing that has stopped me...at least for now...:) I have 12 dogs that I love. They deserve my attention and my time. That's difficult enough as it is. And with 12 dogs , all getting older every day, there are continually increasing medical costs. They have all run flyball for me and done it to the best of their abilities. Probably they all could have done better with a better trainer than me....But that too is another blog. So I figure I owe them. Not fair to them for me to get another puppy. And don't forget the increasing difficuties in finding someone you can trust to watch your dogs if you ever decide to go out of town without them. Forget the cost...just finding someone that can handle that many dogs is almost impossible. Oh my gosh, I'm totally having puppy fever too! I'm holding off though because I don't have time to do the puppy training (I've had to give up Agility/Obed, Flyball is my last hold out). Plus, I need to buy a Flyball bus... or a RV first. Hey! We like our pterodactyl cross. She flies! Right there with you, although I have far fewer dogs at home (only 3!). My team is going through some serious changes... the foremost being a lack of folks willing to travel. So, that leaves me as, basically, a one-person team. (Luckily I travel with my own boxloader and an extra handler.) I have three large dogs. What I need is a height dog. I've even got one in mind... my sister's rescue.